Natural wonders: Close to the Israeli-Egypt border, Taba holidays 2019 are famed for dramatic rocky mountains, crystal clear sea and arid sandy landscapes. But that’s not all that will delight you on holidays here. This far northern corner of the Red Sea has lots to explore, primarily dive sites teeming with colourful fish and unusual marine creatures. Dive sites: Taba holidays have something of an unspoilt quality to them, and this is certainly the case in the dive sites here. One of the most popular dive sites in Taba is called ‘The Aquarium’ largely because there is so much aquatic life within a relatively small area. Look out for frogfish in Taba too, they are incredibly unusual creatures which grow moss and spindly tentacles to mimic their surroundings for camouflage. While Marsa El Muqabila is a great site for beginners because the currents are softer, but there’s still a great variety of fish including puffers, turtles and barracudas. Three Corners El Wekala Golf Course: Located in Taba Heights (an exclusive hotel resort) this impressive golf 18-hole course contrasts lush greenery with golden desert sand. And whether it’s the endless horizon of the Red Sea or rocky mountains, every hole has amazing views, making golfing holidays an attractive prospect here. Castle Zaman: It’s an unusual one this! Castle Zaman is a modern monument constructed to look like the medieval castles of old. It sits atop a hill overlooking four countries – Israel, Jordan, Saudi Arabia and Egypt, on the ancient road which connects St. Catherine’s Monastery with Jerusalem. The castle also has a bar, swimming pool and a special luxury restaurant. Casa Taba: Part of the luxurious, eleven-storey Hilton hotel which offers all inclusive holidays in Taba, this classy restaurant is open to everyone. The decor has an elegant style of contrasting black and white colours, which matches the consistent sophistication of the food. The menu includes ultra-fresh seafood dishes like jumbo tiger prawns and classic Italian meals like lasagne and Spaghetti Carbonara. Castle Zaman: As mentioned previously, as well as a modern landmark, Castle Zaman also functions as a luxury restaurant. The food here is unique because it is slow-cooked (taking around 1-3 hours), which makes the meat exceptionally soft and moist. Lamb, turkey and fish are slow-roasted in a pot with vegetables, with the resulting dishes being juicy and full of flavour. Bird Nest: This restaurant offers an authentic taste of Thailand on Taba holidays. The menu includes classic dishes like the hot and sour tom yum prawn soup, green chicken curry and renowned Pad Thai noodles. Hotel drinks and Taba casino: Although there aren’t many independent bars in Taba, you’re free to drink in all of the hotels in the tourist area of the resort. 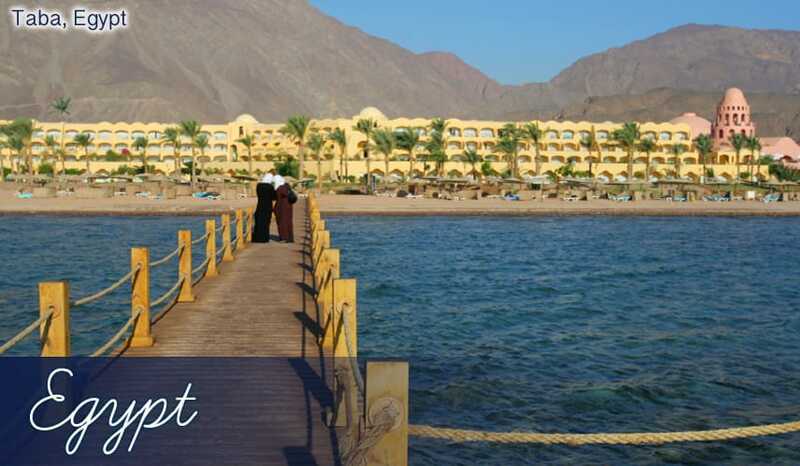 Taba Heights is the main hotel resort in the area, (it’s a collection of all inclusive hotels) and it’s here you’ll find beautifully presented, elegant bars from Marriott, Sofitel and Hilton. The Hilton hotel has another attraction too, in its modern casino. All the games you’d expect are played here including poker, blackjack and roulette.